Why I'm Throwing Away All Of My Makeup — walk in love. I've always enjoyed doing my makeup. Of course over the last few years of motherhood, I wear it less often or wear less of it in general, but I still love it. So you better believe I am loving it even more now that I know it's safer. Several weeks ago I knocked my foundation bottle off our bathroom shelf and onto the tile floor. It shattered everywhere and I had to just throw it all away. Which left me with the task of either going to Target and buying that exact same foundation again or doing a little research into something that was better for me and my skin. A day or two later I found myself at Target (surprise, surprise), standing in the makeup aisles, looking at all the options. I picked up the foundation I've been using for years, flipped over the box and started to read the ingredients. The list was incredibly long, and while I didn't know exactly what I should be avoiding, I just felt compelled to put it back on the shelf. So I did. Fast forward another week and I still hadn't purchased a replacement foundation for the bottle I'd broken. Even though it was a very simple decision I needed to make, it didn't feel that way. I didn't want to spend a bunch of time reading and researching and comparing and looking at reviews and all that, just for one bottle of foundation. What about all of the other things in my makeup bag that needed replacing?! I don't have time for this! I've heard it said from several smart and wonderful women whose books I love to read that we should pay attention to what makes us cry. To what really moves us. And to not just write it off in the name of "I'm emotional" or "hormones". I love that advice and it's something I have paid attention to on a deeper level for a while now. Now I know why I cry at kid's sporting events of kid's I don't even know. It's not just about how cute little kids are, it's about how hard they're trying, unafraid to give something their full effort. Because fear, or in my case fear of embarrassment, is not what fuels them. It's passion, enthusiasm and a belief in their team and themselves that fuels them and I want to be more like that. Which is why when I see it modeled in kid's who are trying their hardest on the soccer field or while running a race, it makes me cry. Like hard. And so, here I am deciding to yet again pay attention to what moves me -- the call to choose clean beauty and safer products for me. All that to say, little by little we've made progress and are better, and healthier, because of it. But the one thing I never made a priority was anything solely for me. I always felt like it could wait, or wasn't a bit deal, or to be totally honest, just didn't care enough. "Parabens in my kid's lotions = no way!! Parabens in my makeup = Ehh, it's fine. It's not like it's that much." I believe that's why Beautycounter has struck such a chord with me. Because not only are they advocating for change in the industry (amen!! ), and providing wonderful products as part of the solution (seriously, so good), but because I connected with a level of "you have permission to care about the things that go on your body and not just everyone else's." I am making one single decision now to eliminate countless decisions in the future. 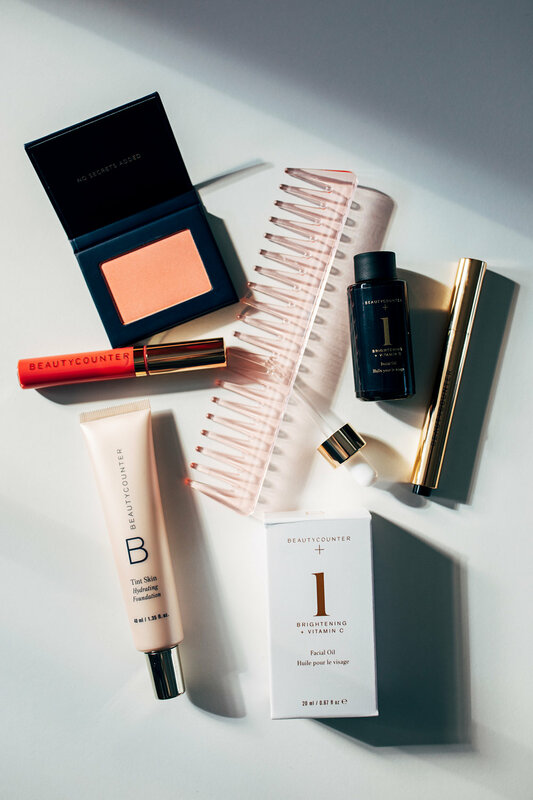 I am switching to Beautycounter. I am choosing to advocate for change and share about products that I truly love and I know you will too. So, here I am, with way less in my makeup bag than a few weeks ago, but instead, with a bag full of products that are safe for me and work just as well (if not better) than the items that I replaced. Also, turns out that foundation I'd loved and used for years was loaded with several things from The Never List, the worst being methylparaben and ethylparaben. If you've ever had any hesitation in reading the labels on your products or switching to clean, I hope you'll join me on this journey. Let's get safer products into the hands of everyone -- and that starts with you. I am going to be sharing more about what IS in my bag now, the skin care routine I've started, and much more on my new Instagram account - @easyprettyclean. Hop on over there and give me a follow! Please don’t hesitate to message me, or text me with any questions you might have. I know it can feel like “Where do I even start? !”, or if you want to try a skincare product before you purchase I can do my best to get you a sample. P.S. If you’re reading this post between the dates of April 9th and April 15th 2019, there is a site wide Friends & Family discount running for 15% off. Don’t miss it! *Some exclusions do apply.